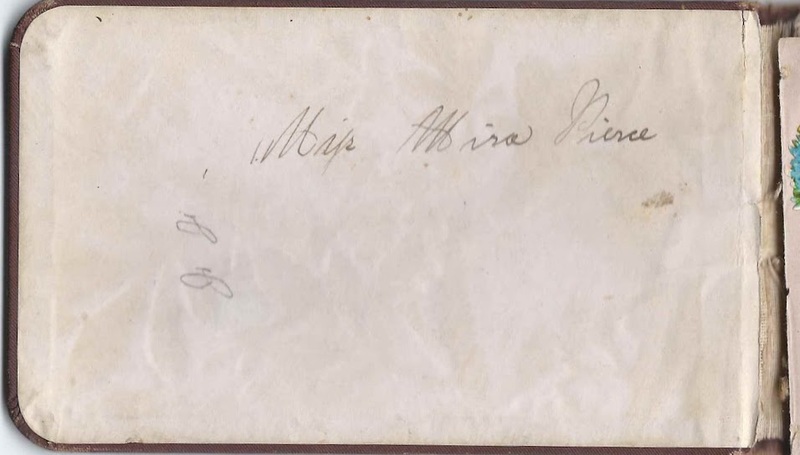 1880s autograph album of Almira Pierce, "Mira", of Troupsburg, New York. The album is approximately 5-1/4" x 3" and contains the sentiments of 22 people, with several unsigned pages. An alphabetical list of the signers appears at the end of this post. Almira Pierce was born 27 October 1870 at Troupsburg, New York, the daughter of Henry Levi Pierce and his first wife Hannah Lavisa (Kelly) Pierce. Hannah died in 1872. Henry later married Eliza Jane Coffin. Almira had, I believe, four siblings, two of whom signed pages in her album. Her older brother Walter Pierce of Troupsburg, New York, and a faint page that I believe was written by Almira's older sister Alice Pierce. About 1889, Almira Pierce became the second or third wife of widower Frank L. Waight, son of George Franklin Waight and Ellen (Murphy) Waight. They had a daughter Florence M. Waight, born 6 August 1889 at Jasper, New York. Sadly, Almira died in 1896. Florence was living with Almira's father Henry Levi Coffin and wife Eliza at the time of the enumeration of the 1900 Census of Troupsburg, New York. 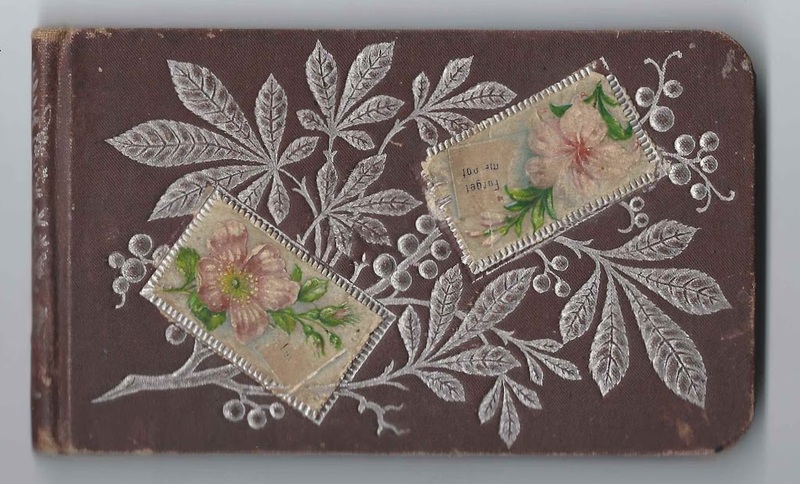 One of the fancier pages in the album was inscribed by Chancy Hulburt of Troupsburg, New York, on February 8, 1883. Violetta M. ? ; signed in 1883; surname possibly Le__? Robert Adams of Troupsburg, New York, signed on December 28, 1882; presumably Robert Alphonsus Adams, brother of signer Margaret Cecilia Adams, "Maggie." Maggie C. Adams of Troupsburg, New York, signed on December 28, 1882; presumably Margaret Cecilia Adams, sister of signer Robert Alphonsus Adams. H. E. Holt; possibly Hiram E. Holt of Troupsburg, New York. 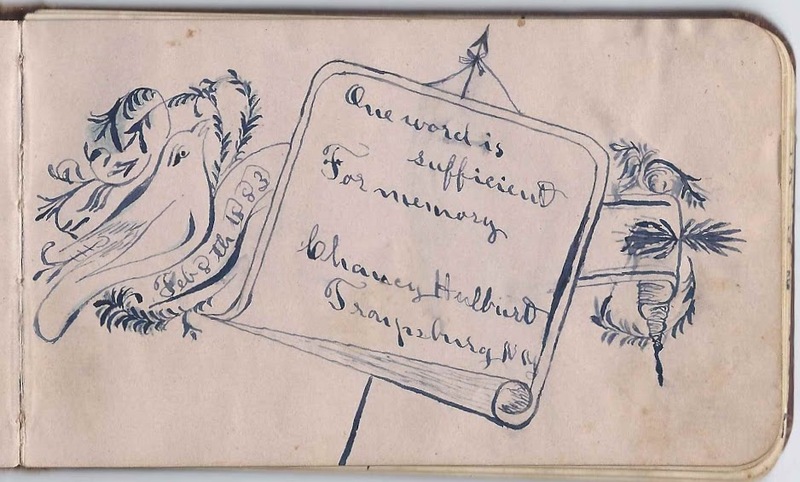 Chancy Hulburt of Troupsburg, New York, signed on February 8, 1883; sketched an intricate design of bird, scroll, etc. Very faint, but appears to be Alice Pierce, who signed on February 11, 1883; she was Almira's older sister.